Pretty much anyone can present information, but an honestly good eLearning course designer knows how to make that information stick with learners even when that audience isn’t interested. Because that’s the nature of an eLearning course: sometimes your audience is enthralled with the subject and sometimes they’re just being pushed to learn because of a job or class. It should be your goal to make content memorable no matter your audience’s interest level. One of the best ways to do this is to incorporate engaging and unique characters in your courses. A learner might not remember every piece of content you present to them, but they will remember an aqua aardvark appropriately named ADDIE. While that might be too cartoonish or “out there” for many courses, I think you can see the point of how using a character gives your audience something to visualize and hold onto in the sea of new information they are being immersed in. The character types presented in this article are classics and can be adapted to just about any situation giving you a flexible base to work with. 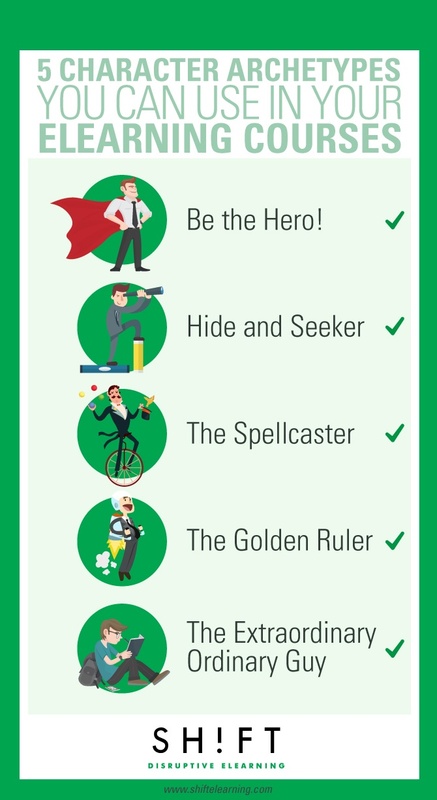 The key when using these archetypes is planning out exactly who they are and what they are intended to accomplish in your course. So, let’s meet our eLearning cast! A warrior or hero type character rides into battle and conquers his/her enemies…with knowledge! Ok, maybe a sword helps too, along with unfailing courage and athletic ability. That being said, a hero character doesn’t have to be narrowly defined as someone with physical prowess. When to Use this Character: A warrior is best used when a feat must be accomplished and to demonstrate how a learner can become as adept at a task as possible. While you could use a physically strong character as a knight or athlete, this can also be someone like a teacher who has to battle her way through figuring out how to teach difficult students. A character who sets out to explore new worlds to better their place in life or to relieve boredom can be an excellent way to bring learners into your course because many will see themselves in this character as they, too, seek to enrich themselves. Explorer or seeker characters are bold, but their adventurousness has an underlying tinge of fear because they are often running from a problem and are terrified of having to go back. When to Use This Character: An eLearning course teaching the foundations of entrepreneurship might include such a character as you take your learners on a journey with a middle-aged man who has just lost his job and wants to start his own business. He is seeking new options, but the fear of failure is very real and very relatable. Ok, maybe not an actual spellcaster, wizard or magician but more like someone who has the power to transform a story. This character acts as a kind of agitator or one who gets action started in a story. A transformative character is typically very intelligent and looks for ways to use power to their advantage and change their surroundings, other people or even themselves. Unlike the previous two character types, this one has the most potential to be negative as well as positive. When to Use This Character: While this character type doesn’t need to be a villain, they can be cast as one. Consider our last example or a man trying to start his own business. An agitator character could be a landlord raising the rent on his storefront because he wants to use the land for something else but this, in turn, forces our seeker to explore an online retail space. The magician could also be a business partner who knows the ins and outs of the business and has a vision for what can be done and pushes things in another direction. Many stories need a leader but the question is, will a leader in your story dominate others or guide them to success? These character types, like spellcasters, have the potential to be good or evil and represent power and control. Because of this, this character can inspire learners to take control in their own lives and education or serve as a reminder to not be controlling of others when they are in a management position. When to Use This Character: Continuing with our example of the entrepreneur, this character type could serve as a company owner who shows our main character how to run a successful business or could play more of a villain who rules his company with an iron fist or engages in questionable practices to demonstrate what not to do. Sometimes what you really need is an everyman character, one that learners can easily see themselves in and experience joys and sorrow as he/she does. This character helps learners experience empathy as we see it as someone who teaches the strength they have learned without asking for much in return. When to Use this Character: The everyman, as the name implies, has a place in just about every course and can be used as a foil to other characters. Orphans are a little more specialized but can be used to great advantage when you need an emotional response. An eLearning course directed at teaching law enforcement officials how to empathize and speak to victims of a crime would be a good time to use a distressed character. While there are still many other challenges to getting and keeping your audience’s attention, writing better stories, believable dialogue, and relatable characters is a really good place to start. Consider these five character archetypes the next time you’re creating a storyboard and think about people in your workplace who fit with these types and you will be well on your way to creating authentic personas. The Twelve Archetypes. Based on the research by Carol S. Pearson, Ph.D.